Directed by Michelangelo Antonioni and written by Antonioni and Tonino Guerra, Il deserto roso (Red Desert) is the story of a woman coping with her existence at an industrial world as she becomes uneasy with the world of modernism. 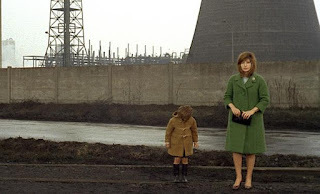 The film is another of Antonioni’s exploration with alienation as it revolves around the world of industrialization and social changes in a world that is very modern. Starring Monica Vitti, Carlo Chionetti, Xenia Valderi, Valerio Bartoleschi, Rita Renoir, and Richard Harris. Il deserto roso is an eerie and mesmerizing film from Michelangelo Antonioni. Following a car accident that left her mentally ill, the film revolves around a woman who deals with her surroundings and emotional state as well as the industrial landscape that she lives in. It’s a film that explores the modern world and its sense of despair as it reflects on a woman’s state of mind as she feels alone not just by her surroundings but also in her social and family life. Along the way, Giuliana (Monica Vitti) meets a friend of her husband named Corrado (Richard Harris) who is trying to find workers for a project he’s doing in South America. Corrado is attracted to Giuliana as he also understands her feelings of isolation but tells her to accept this new reality she’s in which she’s having a hard time coping with. The film’s screenplay by Michelangelo Antonioni and Tonino Guerra explores a world where factories, industrial buildings, and shipping docks are what is happening as things such as beautiful beaches and such are pretty much non-existent. For Giuliana, it’s a world she really has no understanding with as she also copes with her emotions as she remains haunted by the accident that nearly killed her but only put her in the hospital for a months as she tells Corrado a story about a girl she knew at the hospital. It’s a story that Giuliana would tell Corrado that would haunt her as her attempts to be part of the party or something social has her feeling lost and lonely. Even as she would encounter things in her own family life that is troubling as she becomes confused over what is happening to her and how can she adapt to an environment that is very cold and desolate. Antonioni’s direction is definitely entrancing in not just its visuals but also in the locations he sets the film in. Shot largely on location in Ravenna, Italy, the film has this look of a world that feels sort of futuristic but also one that feels very modern but in a discomforting setting. Much of the locations has Antonioni take great stock into not just his approach to framing but also in how the environment matches the sense of turmoil in the mind of Giuliana. It’s a world where there aren’t a lot of colors as Antonioni often gazes into images of dirty puddles, polluted lakes, muddy grounds, and lots of fog as it plays into a world that is just becoming messy and horrifying to be at. Even as there’s a key sequence where Giuliana, Corrado, Giuliana’s husband Ugo (Carlo Chionetti) are partying with some friends in this small shack close to a shipping dock where the few instances of color are later overwhelmed by what is going on outside. The direction also has Antonioni use close-ups in ways that are just eerie as it plays to the unraveling of Giuliana where she has no clue into what is happening around her. Most notably an incident involving her son Valerio (Valerio Bartoleschi) which only adds to the sense of despair that looms over her. Antonioni’s approach to framing the actors is also very evident in the way it plays to Giuliana’s own sense of detachment from the people around her as the aftermath of the scene at the shack showcases how lost she is. There’s also elements where sound is important as it plays into Giuliana’s own sense of unraveling and how she interacts with her surroundings as there’s another scene with her son where she tells him a story about a world that is much simpler but also has a character who would endure the same confusion that Giuliana would deal with. Overall, Antonioni creates an intoxicating yet unsettling film about a woman coping with loneliness in a very dark and desolate environment. Cinematographer Carlo Di Palma does brilliant work with the film‘s colorful cinematography with its emphasis on dark and desolate colors for many of the film‘s locations in its industrialized environment to the lush colors in the story that Giuliana tells to her son as well as very few bright moments of color that is overwhelmed by the dreary locations. Editor Eraldo Da Roma does excellent work with the editing as it maintains not just this slow yet methodical pace that Antonioni wanted but also in allowing the scenes to play itself out as it adds to the tumultuous despair in Giuliana‘s emotional state of mind. Art director Piero Poletto and set decorator Sergio Donna do fantastic work with the look of the home Giuliana and Ugo live in that is the epitome of modernism as well as the studio where Giuliana owns but has no idea what to do with it along with the shack where Ugo, Corrado, and Giuliana would have their little party at. Costume designer Gitt Magrini does terrific work with the costumes from the green coat that Giuliana wears as well as some of the very dark clothes that plays into her sense of isolation that she is going through. The sound work of Claudio Maielli is amazing for how it plays into Giuliana‘s state of mind where there‘s moments where it sounds very real as it showcases the modern world at its most disruptive and disconcerting as it‘s one of the film‘s highlights. The film’s music by Giovanni Fusco is superb for its low-key yet haunting score that is largely filled with sound textures and eerie piano pieces as well as electronic music textures by Vittorio Gelmetti that add to the film’s hypnotic and ominous tone as it’s one of the film’s highlights. The film’s incredible cast includes some notable small roles from Emanuela Paola Carboni as the girl in the story that Giuliana tells to Valerio, Giuliano Missirini as a radio telephone operator Giuliana chats with, Lili Rheims as the operator’s wife who visits the shack, Valero Bartoleschi as Giuliana and Ugo’s son, Aldo Grotti as a German client named Max, Rita Renoir and Xenia Valderi as a couple of guests at the shack, and Carlo Chionetti as Giuliana’s husband Ugo who is often absent due to work as he tries to cope with his wife and her strange moods. Richard Harris is excellent as Corrado as a friend of Ugo who visits Italy for business reasons as he becomes attracted to Giuliana while sharing his own feelings of alienation with the industrial world though he has managed to cope with it as additional credit should go to Giuseppe Rinaldi for being the actor who dubs Harris’ voice in the film. Finally, there’s Monica Vitti in a remarkable performance as Giuliana as a woman who unravels by her surroundings and the trauma she suffered from an accident that left her emotionally troubled as it’s an eerie yet ravishing performance from Vitti that plays into a woman coping with a very complicated and dreary world. Il deserto roso is a magnificent film from Michelangelo Antonioni that features a haunting yet enchanting performance from Monica Vitti. The film is an intriguing exploration into the world of isolation and how one reacts to a world that is increasingly modern and complicated that would add to a woman’s own despair with herself. Most notably as it has elements that Antonioni is known for but also has elements that are very accessible as it relates to the idea of alienation and existentialism. In the end, Il deserto roso is a spectacular film from Michelangelo Antonioni. SO excited for this! I have it on my DVR and plan on watching it very, very soon! I LOVE Antonioni's work and reviewed L'avventura a few months back as part of my BlindSpot series. They guy was an amazing filmmaker and Red Desert is one that I have sitting on my DVR. I think you have prodded me to watch it tonight. I'm excited. @Fisti-See it before the end of the year. It's one of favorite films by Antonioni so far. I'm just stoked that I finished his work in feature films from the 1960s. @keith71_98-L'Avventura remains my favorite film of his as based on what I've seen from him so far. He's definitely one of a kind as I hope to explore more of his work in the years to come.